One country of 700-plus islands spread over 180,00sqmi of pristine ocean -- The Bahamas is more than just the ultra-touristy Nassau most people know from those cheesy Atlantis commercials with the dolphins and remade song from Juno. Every corner of this far-flung archipelago has its own distinctive flavor, yet an infectious and laid-back vibe unites its disparate shores. Sure, Nassau has the nightlife, the casinos, and the markets overflowing with straw hats you'll only wear again at Halloween, but you'd be foolish to visit and not hit Smith’s Point Fish Fry on Grand Bahama Island, Regatta in Great Exuma, or Miss Emily’s Blue Bee Bar on Green Turtle Cay. If you want to truly experience The Bahamas, get ready to do some island hopping. 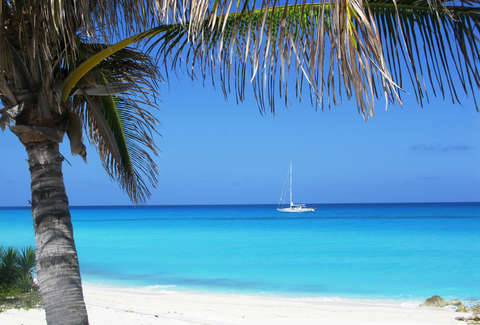 When to go: The weather’s nice year-round, though winters carry more of a chill than they do further south in the Caribbean -- and by 'chill' we mean average night-time temps in the low-to-mid 60s, so yea, still pretty amazing. How to get around: As it is a nation of islands, ideally you’d charter a yacht to hop between them. Assuming you watched too much Gilligan's Island as a kid though and would rather skip the three-hour tour, regularly scheduled puddle-jumpers and ferry services are available. On land, renting a scooter or small car is easy on the bigger islands, but on the smaller ones like Green Turtle or Staniel Cay, a trusty golf cart is your move. 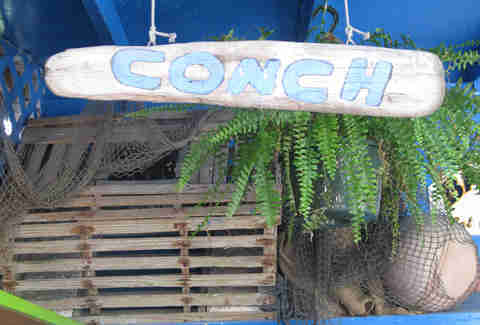 Dining: While Conch is the aforementioned order of the day, there's no shortage of other seafood treats. Lobster season kicks off August 1st and runs until the end of March, making for some excellent eats during the winter months. For more local fare, Arawak Cay’s collection of seafood shacks is the way to go. And adventurous male eaters may want to try a pistil, the conch’s reproductive organ. Long, uncolored, and tasteless, when swallowed whole it purportedly works like Viagra -- no adjacent double soaking tubs required. As for choice eating on the Out Islands, the Wrecking Tree on Green Turtle Cay serves up a nice mix of local Bahamian faves and typical bar food with a side of uniquely Abaconian history. On Great Exuma, family-friendly Exuma Point Bar & Grill offers an authentic West Indian buffet on weekends and some of the strongest Bahama Mama's around, while the seafood and breezy outdoor ambiance of Tippy's in Eleuthera is tough to beat. 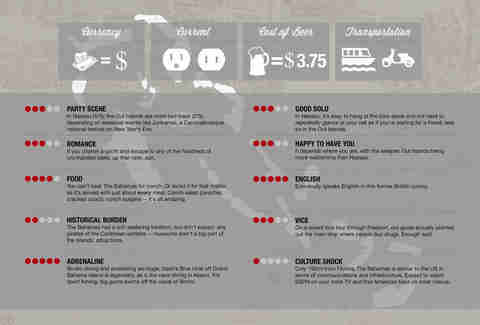 Traveler's tip #1: Buying fresh seafood is often less taxing than reeling it in yourself. In Bimini, you can get lobster from a local fisherman for as little as $2.50 each! Traveler's tip #2: BYOB if you’re going to Spanish Wells. This tight-knit, historically isolated community is dry, as in no booze for sale here, ever -- not just on Sundays before noon. They don’t care if you bring your own, though. 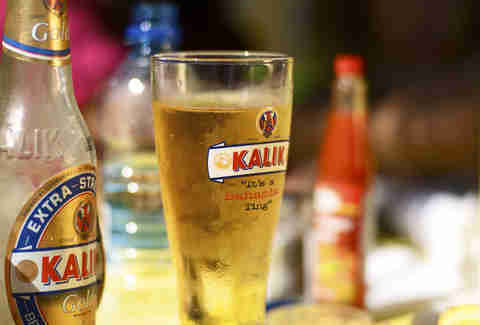 Local brews: Speaking of BYOB, The Bahamas has its fair share of native suds, with 7% ABV golden lager Kalik (from Commonwealth Brewing) claiming the distinction of national beer. There're also a handful of styles from six-year-old Bahaman Brewery, including Sands, High Rock, Strong Back Stout, and the unfortunately named pale lager, Bush Crack. Nightlife: Nassau is the place for nightlife in The Bahamas, with most of the action centered around the Paradise Island and downtown waterfront. Fluid, Bambu, and Aura are three of the top hotspots. DJs at Bambu spin a super-charged mix of the latest salsa, soca, calypso, reggae, and reggaeton; Aura (in the Atlantis resort) is more upscale and contemporary (mixing top-40 and hip-hop with island favorites) and attracts a celebrity crowd; and Fluid is all about the latest reggae jams. All three clubs get going around midnight, with Bambu keeping the party hopping until 4a. Expect dress codes, cover charges, and VIP sections, just as you would in New York, Miami, or LA. Traveler's tip #3: Dress to impress at Nassau nightclubs. You may be in the tropics, but shorts and flip-flops are a definite no-no at trendy spots. While jeans and button-downs are generally cool at most clubs, you think the ladies pictured above are talking to a dude wearing New Balance? Uh-uh. Surfing in Eleuthera: A short plane ride from Nassau (which, incidentally, is also the answer to every "Where is ____ located" question in The Bahamas) will take you to the surfing paradise of Eleuthera. The waves here are best between October and April, with reef breaks, point breaks (RIP Patrick Swayze), and even beach breaks along the island’s north and east coasts. Feeding stingrays on Gun Cay: Forget the touristy seaquariums and instead trek to Gun Cay, a tiny, uninhabited islet in the Bimini chain. There, on the island’s most northerly point, you’ll find Honeymoon Harbour, a pristine patch of sand where a school of stingrays has gathered daily for years, having first been attracted to the spot by fishermen cleaning the day's catch. Today, anyone with some bait -- and a little courage -- can have these bad boys eating right out of their hands. 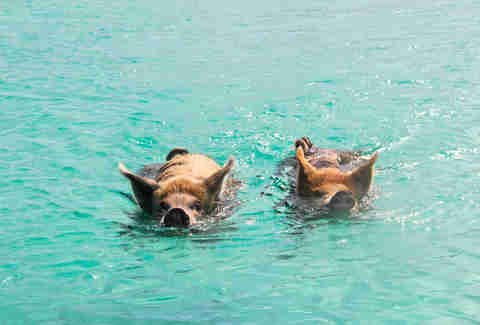 Swimming with pigs off Big Major: For an even more uncommon animal encounter, hop over to Big Majors Spot (a small islet off the coast of Staniel Cay in the Exumas) to feed the swimming pigs. Just allow 30min after they eat before jumping in, please. To experience what an afternoon backstroking with pigs is like, click here. Where to stay: Nassau has every level of accommodation, from airbnbs starting at $50/nt to swanky penthouses on Paradise Island. 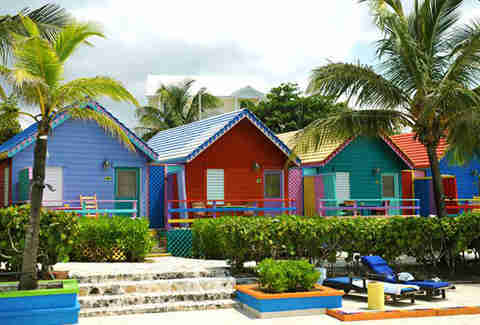 Music aficionados will want to check into Compass Point -- the stylishly colorful seaside property once owned by record producer Chris Blackwell -- or nearby Marley Resort, formerly Bob’s Bahamas retreat. If you’re in Nassau on business and prefer more Bahaman charm, the Graycliff downtown boasts handmade signature cigars rolled on-site and exceptional local cuisine.